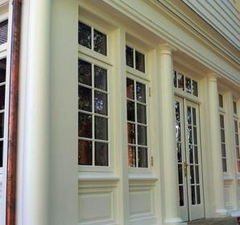 Millcraft Door, Inc. offers historic replacement windows for historical homes. These are true vintage window replications. True divided lite (bars & muntins down to 5/8") single glaze, antique glass, weights & pulleys. We have worked with historic associations and this product is sure to please the historic preservation purist! Millcraft Door, Inc. is owned and operated by Andrew Halderman and his wife. Millcraft Door, Inc. specializes in replacement front doors, replacement windows and historic replication millwork for homeowners, architects, designers and luxury home builders. Andrew is a seasoned architectural woodworker, and has spent much of his life in the trade. Shop tours are offered by appointment where visitors can see firsthand his passion for what he does, while experiencing the feel of an old world craftsman's shop. Being a smaller shop, Millcraft Door, Inc. is able to provide its customers with a highly personalized level of service, while at the same time delivering a superior level of craftsmanship in construction. Moreover, Millcraft Door, Inc. uses the most advanced and environmentally friendly industrial adhesives and the finest European hardware, seals and finishes.